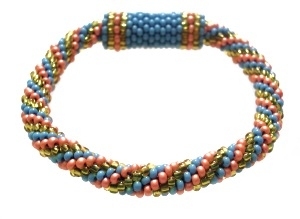 This is a bead crochet bracelet using three different colours to form a spiral pattern. I added a peyote tube beaded in the same colours but a different pattern to cover the join. The beaded band also adds interest to the bracelet and serves as a focal point.